Logan Hospital has two designated drop off/pick up zones for the main hospital building. These zones can be accessed via Armstrong Road and are subject to time restrictions. Logan Hospital provides almost 600 free public parking spaces including more than 200 undercover spaces. Entry to the public car park is via Armstrong Road. Vehicles displaying a Disabled Parking Permit can park in designated disabled bays located in the main car park and undercover car park. 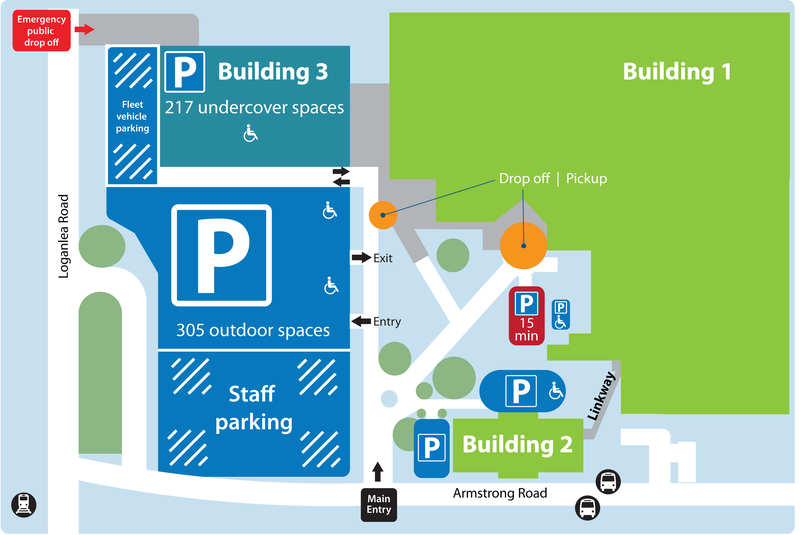 A limited number of disabled parking bays are available at the front of the main hospital building. Logan City Council has time restrictions on street parking in all streets surrounding the hospital. Dedicated bicycle and motorcycle parking spaces are available.